The Coalition Against Racist Education Now, a coalition of activists students at Williams College, recently released a list of demands “calling upon the College’s trustees to fulfill their ‘obligation to the well-being and safety of its students, faculty and staff’,” according to The Williams Record. As a community, we must recognize that the College is a predominantly white institution in which students of color often feel tokenized, both in their residences and more broadly on campus. Establishing affinity housing will not singlehandedly solve this problem, but it will assist in making the College a more welcoming, supportive and safe community for minoritized students. 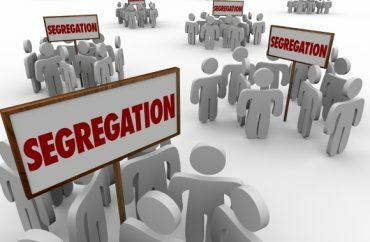 roccolore : It's funny how Democrats love to lecture everyone else on diversity while advocating the return of segregation. For those 3 million people (a number reflecting the combined average weekday primetime audience of CNN and MSNBC) Trump’s guilt is an indisputable fact, his presidency an ongoing crime against humanity, his 2016 election a fraud. In a nation of 325 million people, of course, 3 million is less than a single percentage point. However, that hard-core audience of obsessive Trump-haters includes every Democrat in Washington and the vast majority of our nation’s journalists, university faculty, and other such members of the intelligentsia. Therefore, their deranged idée fixe has enormous influence, calling into existence a sort of anti-Trump industry that manufactures a constant output of rage-inducing propaganda. The CNN/MSNBC bubble is the cable-TV equivalent of a cult compound, where dissent from their political religion is forbidden. For the past two years, the fanatics have been told every night by Rachel Maddow, Don Lemon, et al., that the final destruction of Trump was at hand — “the walls are closing in!” — and the left-wing faithful awaited their deliverance from the evil man in the White House. “Orange Man Bad” — that’s a shorthand label for the anti-Trump mentality, coined by an anonymous contributor on a Reddit forum in 2017, mocking the robotic mindlessness of the president’s enemies. No fact that might contradict their Trump-hating beliefs has any validity to them, because Orange Man Bad. By obverse principle, anything done to harm Trump or his supporters, including libel and violent assault, is considered legitimate, because Orange Man Bad. Living inside a media-generated echo chamber where everyone shares their simplistic worldview, the Trump-haters tune in nightly to their MSNBC/CNN religious revival and are catechized, so to speak, with the latest reiteration of the Orange Man Bad gospel. The delivery of the special counsel’s report was preceded by a press conference at which Attorney General William Barr summarized the result of the investigation. 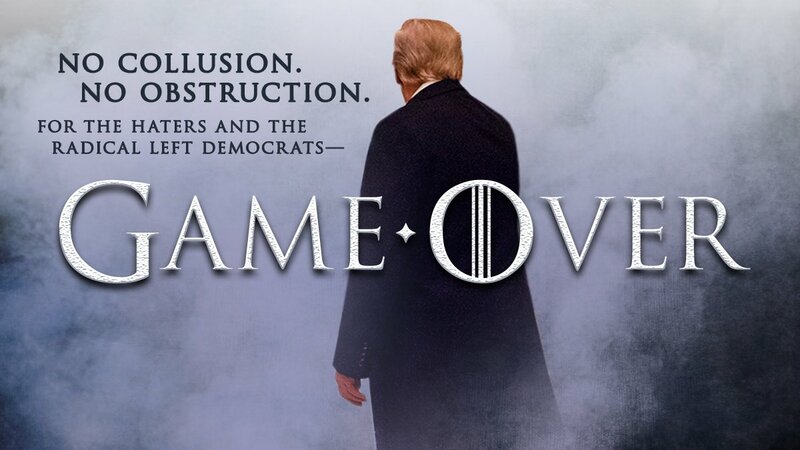 Proven wrong on the matter of “Russian collusion,” the anti-Trump media sifted through the Mueller report in search of evidence of other wrongdoing by the president, who of course must be guilty of something. The Twitter feeds of media types filled up with excerpts of the report proving… what? Well, Trump was very angry about being falsely accused of “collusion,” and he didn’t enjoy watching his former associates being investigated and prosecuted as part of what he considered a partisan witch hunt, inspired in large measure by the phony Steele dossier paid for by the Clinton campaign. But we already knew that. Trump’s animus toward the Mueller investigation was certainly no secret, but being angry is not a crime and, however angry he was, nothing Trump did amounted to obstruction of justice. Because there was no “collusion,” and thus no crime to conceal, it would be hard to figure out how or why justice could be obstructed in such a case. The innocent don’t fear justice, and if Trump was innocent of “collusion” (as Mueller concluded) why should he engage in obstruction? 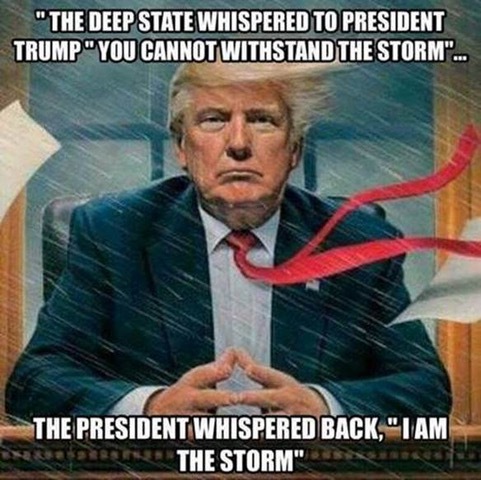 Never mind basic logic, cried the Trump-haters, because Orange Man Bad! CNN went into complete meltdown mode Thursday afternoon, led by the network’s chief legal analyst Jeffrey Toobin, who declared the Mueller report was “pretty bad” and “very damaging” for Trump. MSNBC commentator and former CIA director John Brennan, who’s spent two years promoting the Russian collusion narrative, claimed that the Mueller report, which effectively exonerated Trump, nonetheless contained “really quite extensive” information supporting his own view. Their minds are made up, and mere facts cannot penetrate their ironclad certainty about Trump’s maliciousness. Thus, a 22-month, $25 million federal investigation that disproved their Russian conspiracy theory was really just a waste of time and money. No collusion. No obstruction. No more indictments. The whole Russians-stole-the-election narrative has been conclusively debunked, and despite the Mueller report’s detailed accounting of Trump’s angry outbursts about the investigation, justice was never obstructed. What can be done about the anti-Trump cult? It’s obvious that they cannot be persuaded by rational argument to abandon their paranoid delusions, and they’ll still be ranting about Russia until the day Trump leaves office. They never believed he could win the 2016 election, and the Russian “collusion” theory was a way to deny the reality of his victory. Now we are barely a year-and-a-half away from the next presidential election, and Trump’s chances of winning a second term have significantly increased. The nearly 63 million Americans who voted for Trump seem to be sticking with him — his job approval numbers have gained about 7 points in the Real Clear Politics poll average since December 2017 — and the Democrat field for 2020 is a clown car full of left-wing crazies. Despite what his enemies in the media might believe, the end of the Mueller probe is a clear victory for Trump, and if the economy keeps roaring along like it is now, the odds of him being re-elected are quite good. None of these facts matter to the 3 million who watch CNN and MSNBC, the cable-TV echo chamber defined by the anti-Trump cult mentality of Maddow and Matthews, Joe Scarborough and Erin Burnett, Chris Hayes and Chris Cuomo. The good news is that this alternative universe appears to be shrinking. Maddow has lost nearly a third of her audience since last April, and CNN recently recorded its worst ratings week of the year. It has been said that the definition of insanity is doing the same thing over and over, expecting different results, and this is exactly what Trump’s media enemies seem to be doing. The more often the president mocks them as “fake news,” the more determined they become to destroy him, and the more they limit their audience to the most fanatically deranged Trump-haters. However, it never seems to occur to them that they might be mistaken, no matter how often they find themselves humiliated in the ratings. This answer, too, my friend, is very simple. 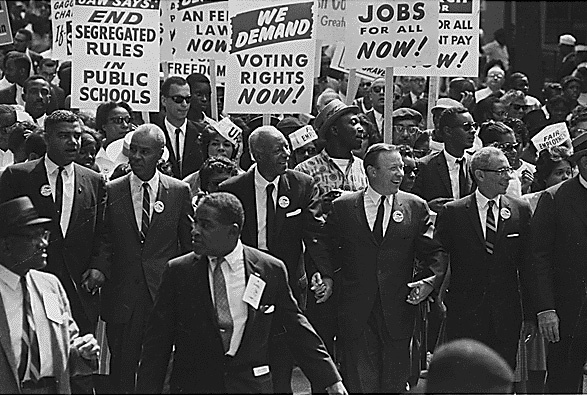 Raynard Jackson is a Pulitzer Award nominated columnist and founder and chairman of Black Americans for a Better Future (BAFBF), a federally registered 527 Super PAC established to get more Blacks involved in the Republican Party. BAFBF focuses on the Black entrepreneur. For more information about BAFBF, visit www.bafbf.org. You can follow Raynard on Twitter; Raynard1223. Starting with the ridiculous DNC-funded dossier, the Obama admin obtained a FISA warrant to spy on the Trump campaign. After Trump won the 2016 election, Democrats called for a ridiculous investigation that culminated with Robert Mueller’s Special Counsel. THERE WAS STILL NO COLLUSION. At the conclusion of the Special Counsel’s investigation which AG Barr summarized saying there was no collusion and no obstruction, Democrats led by Adam Schiff demanded a the full report be released. STILL… THERE WAS NO COLLUSION. Bottom line: Now we know the history of the lies Democrats told the American people as part of their political vendetta against President Trump, Democrats need to be held accountable for recklessly dividing America for their own political gain. Speaking to reporters at the Justice Department Thursday morning, Attorney General Bill Barr addressed questions about obstruction of justice during the Special Counsel investigation into the 2016 presidential election. During his remarks, Barr argued that not only was there no obstruction of justice, but that the White House cooperated with every aspect of the probe, offered witnesses and provided requested documentation. During this section, he specifically cited the Mueller report. "The White House fully cooperated with the Special Counsel’s investigation, providing unfettered access to campaign and White House documents, directing senior aides to testify freely, and asserting no privilege claims. And at the same time, the President took no act that in fact deprived the Special Counsel of the documents and witnesses necessary to complete his investigation," Barr said. "Apart from whether the acts were obstructive, this evidence of non-corrupt motives weighs heavily against any allegation that the President had a corrupt intent to obstruct the investigation." Barr also provided context surrounding President Trump's frustration with the probe, which he cooperated with anyway. "In assessing the President’s actions discussed in the report, it is important to bear in mind the context. President Trump faced an unprecedented situation. As he entered into office, and sought to perform his responsibilities as President, federal agents and prosecutors were scrutinizing his conduct before and after taking office, and the conduct of some of his associates," Barr said. "At the same time, there was relentless speculation in the news media about the President’s personal culpability. Yet, as he said from the beginning, there was in fact no collusion. And as the Special Counsel’s report acknowledges, there is substantial evidence to show that the President was frustrated and angered by a sincere belief that the investigation was undermining his presidency, propelled by his political opponents, and fueled by illegal leaks." 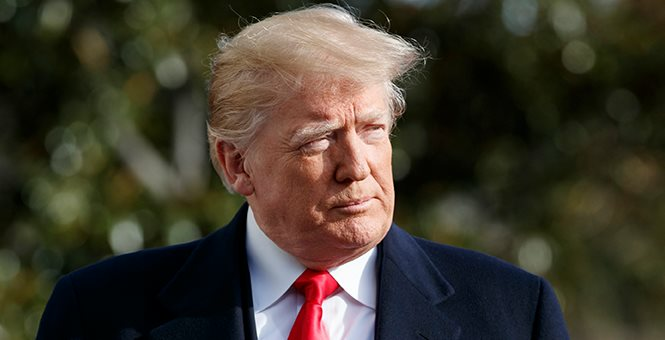 When Barr released his four-page letter with the bottom line findings three weeks ago, the White House said President Trump would not assert executive privilege over the contents in the final report. That position still stands. 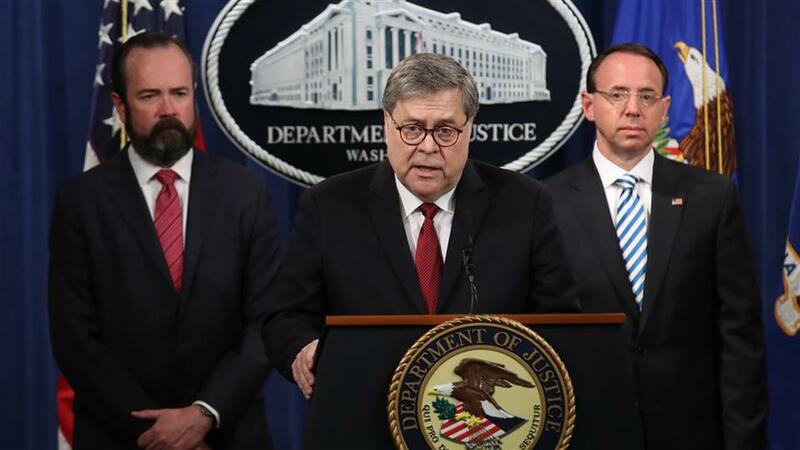 "Accordingly, the public report I am releasing today contains redactions only for the four categories that I previously outlined, and no material has been redacted based on executive privilege," Barr said. Shortly after the press conference ended, President Trump tweeted the following. 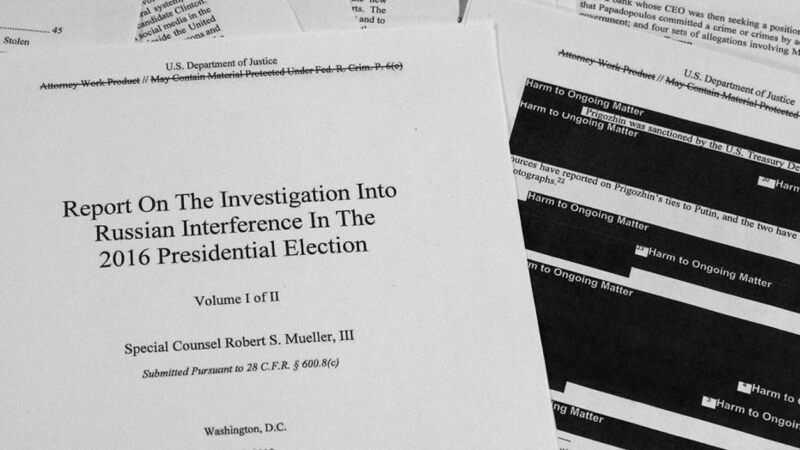 The Justice Department posts online a redacted version of special counsel Robert Mueller's report on Russian interference in the 2016 presidential election online; chief intelligence correspondent Catherine Herridge reports. This included President Trump allegedly telling his White House counsel in June 2017 to inform the acting attorney general that Mueller had conflicts of interest and "must be removed." The report said Trump also fumed over the original appointment -- lamenting it would mean the "end of his presidency" -- first telling then-DOJ leader Jeff Sessions he should resign, and later trying to get Session to take back control of the probe. Mueller ultimately did not reach a conclusion on whether the president's conduct amounted to obstruction, stating: "[W]hile this report does not conclude that the President committed a crime, it also does not exonerate him." But even though Barr's DOJ determined they did not have evidence to pursue such a case, the details in the report only fueled Democrats' mounting calls to not only see the unredacted report but have Mueller testify. "This is exactly why we need to hear directly from Special Counsel Mueller and receive the full, unredacted report with the underlying evidence," House Judiciary Committee Chairman Jerry Nadler tweeted, highlighting that section. Trump and his legal team, though, declared victory upon the release of the report. "No collusion, no obstruction," Trump said. The swift reactions indicated the release of the report is only likely to fuel, not quiet, the long-raging debate in Washington over the Russia probe and serve as fodder going into the 2020 election year. As stated in Barr’s summary last month and reiterated again at a press conference earlier Thursday morning, though, the special counsel did not find clear evidence of collusion between members of the Trump campaign and Russia. “[T]he investigation did not establish that members of the Trump Campaign conspired or coordinated with the Russian government in its election interference activities,” the report said, while also saying there were "links" between the two. “While the investigation identified numerous links between individuals with ties to the Russian government and individuals associated with the Trump Campaign, the evidence was not sufficient to support criminal charges. Among other things, the evidence was not sufficient to charge any Campaign official as an unregistered agent of the Russian government or other Russian principal,” the special counsel report stated. The redactions in the report were color-coded, labeled with the reasoning behind each redaction, with categories including "grand jury material," "personal privacy," "investigative technique;" and "harm to ongoing matter." The report itself noted that they obtained evidence about the president’s “actions and intent,” and that presented “difficult issues that would need to be resolved” if they were making a traditional judgment. The report revealed that the president reacted to the news a special counsel had been appointed by telling his advisers that it was “the end of his presidency,” and demanding that Sessions resign. Once Sessions submitted his resignation, the president did not accept it. The report also details Trump's alleged effort to have Mueller sidelined, amid reports at the time that special counsel’s office was investigating the president for obstruction of justice. The report details a dramatic moment where the president's White House counsel apparently rejected the push. “On June 19, 2017, the president met one-on-one in the Oval Office with his former campaign manager Corey Lewandowski, a trusted advisor outside the government, and dictated a message for Lewandowski to deliver to Sessions,” the report said. The first phase was related to the firing of Comey. “During that time, the President had been repeatedly told he was not personally under investigation. The evidence detailed in the report related to allegations of obstruction of justice, though, is likely to come under intense scrutiny from congressional Democrats and could be used in their sweeping Trump-related investigations. Fox News' Adam Shaw, Jake Gibson, Catherine Herridge, and Bill Mears contributed to this report. It is a truism of contemporary public life that liberals are bullies. And the bullying is worst on college campuses, which are now, more than ever, islands of repression in a sea of freedom. 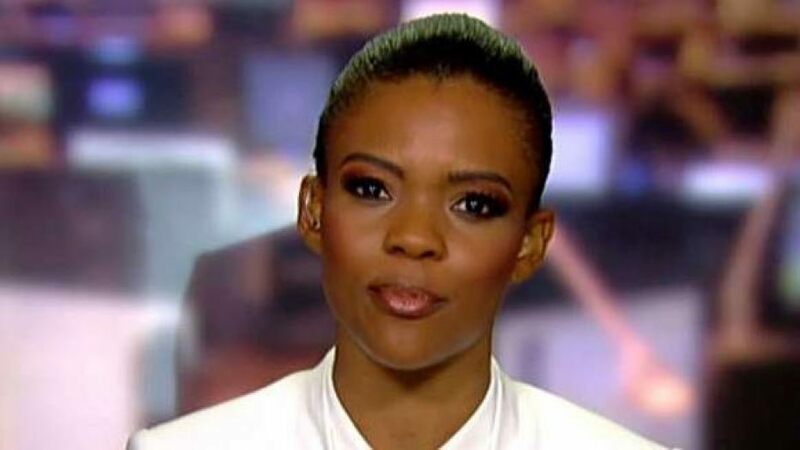 But some brave souls, like Candace Owens, are willing to run the leftist gauntlet to bring a dose of common sense to college students. Candace was at the University of Pennsylvania, which I believe was once a pretty good institution. She was besieged and harassed by an Antifa group, augmented by the usual cadre of liberals. Candace is right about Antifa. Antifa is indeed a neo-KKK organization because they are, as she says, “the Democrats’ domestic terrorist arm,” just as the KKK was for many years. 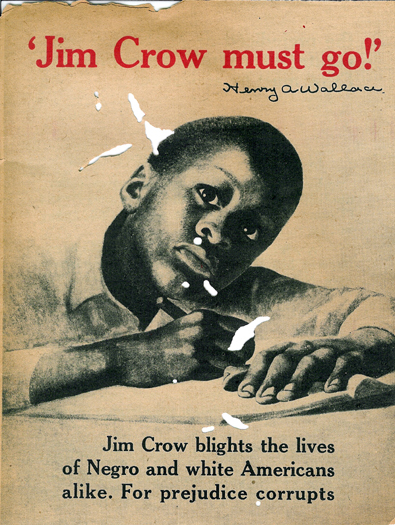 Candace’s grandfather was besieged by the KKK, which, as I recall, fired shots into his house. Two generations later, Candace is confronting the same kind of pure evil. Thank goodness we have people with such courage in our public life. The police said that the assailants repeatedly struck Nable until he fell to the ground. They then "removed property from the victim, and destroyed items of value." Crawford and Roberson are facing charges of robbery, conspiracy to commit robbery and second-degree assault, as well as related crimes. Nable told Fox 5 DC that he immigrated to the U.S. from Togo in 2007 and that he is now a U.S. citizen. He said to the news station that he's been staunch supporter of Trump since he launched his presidential campaign. He added to WJLA, a local ABC affiliate, that Trump's campaign caused him to register as a Republican. 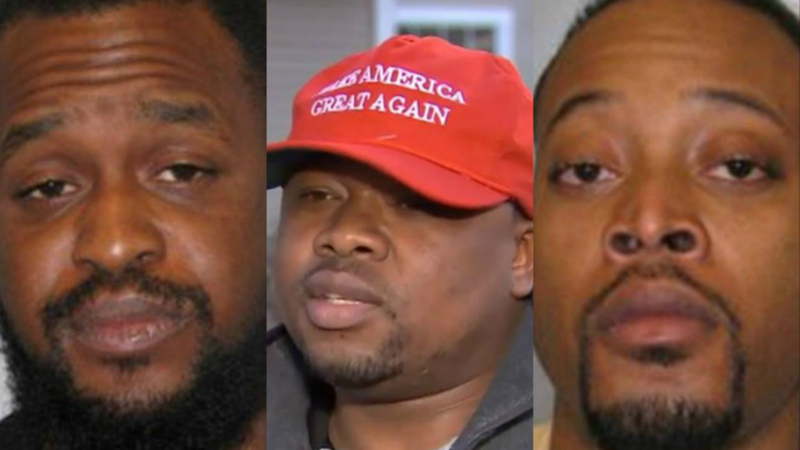 The caps with Trump's signature slogan have been at the center of multiple altercations since Trump's presidential campaign. A woman in Massachusetts was charged in February with disorderly conduct after confronting a man in a Mexican restaurant and forcefully taking his MAGA hat off his head. Immigration and Customs Enforcement (ICE) said at the time that the woman was in the U.S. illegally and now faces deportation. 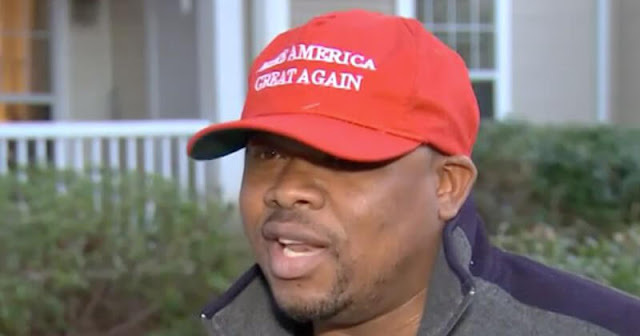 That same month, a New Jersey teen was arrested and charged with attacking an 81-year-old man for wearing a "MAGA" hat.